Ardfern Riding Centre is 120 yards north in the big park below the house and is often busy with horses, jumps and dressage rings. Instruction is available in the B.H.S. approved school, also half day rides, full day and even week long treks into the remoter hill paths of the west highlands. A further 120 yards takes you to the sea, past Lunga cottages, which are sometimes let for holidays and sometimes for the whole season. The track takes you to the small pier and boathouse, which overlooks the sandy and pebbly bay. Here you can launch small boats, and there are moorings for guest craft up to 35ft. The coastline from here south is completely wild for ten miles. There are many favourite and secret picnic spots. Cockles, mussels winkles and palourdes can be gathered and those with the equipment and knowledge could also catch salmon, seatrout, lobsters, crab crayfish, prawns and scallops, as well as a variety of sea fish. Approaching Lunga you will have seen Craobh Haven, two bays to the north. This is the nearest village. Three islands have been linked to the coast with great rock causeways, making Craobh Haven Marina, a safe haven for 200 yachts and fishing boats. The village has a grocery shop, a craft and coffee shop, a launderette, and a ships chandlery. There is a boatyard with slipway and straddle carrier for launching larger boats. Boat trips and yacht charters are available from here. The Pub ‘The Lord of the Isles, is open all day in the summer serving good bar meals and has an excellent restaurant., and often has live music at the weekends. The windows and patio overlook the Marina and boats and is an excelent place to sit and watch the world go by. Cruises from Craobh Marina to the Gulf of Corryvreckan and Islands of Nether Lorn featuring spectacular whirlpools, abundant wildlife and truly wonderful scenery. Fishing is permitted along the coastline…the pier is a great place to cast at high tide as well as at the end of the marina walls. Small rods can be purchased from Corrie House or the village store. Just a mere 120 yards from Lunga House and Cottages is Ardfern Riding Centre which is often busy with horses, jumps and dressage rings. Instruction is available in the B.H.S. approved school, also half day rides, full day and even week long treks into the remoter hill paths of the west highlands. A further 120 yards takes you to the sea, past Lunga cottages, which are sometimes let for holidays and sometimes for the whole season. The track takes you to the small pier and boathouse, which overlooks the sandy and pebbly bay. The coastline from here south is completely wild for ten miles and there are many favorite and secret picnic spots. Cockles, mussels winkles and palourdes can be gathered and those with the equipment and knowledge could also catch salmon, seatrout, lobsters, crab, crayfish, prawns and scallops, as well as a variety of sea fish. Oak framed, glass walled and overlooking the Gulf of Corryvreckan, the Corrie Cook School offers cookery workshops, demos and bespoke packages for all levels of cook. Two miles north is Arduine, where the Loch Melfort Hotel has a nice bar and restaurant and spectacular views especially at sunset and serves an excellent menu featuring local seafood. The neighbouring Arduine Gardens (NTS) are open to the public. They have a world famous display of rhododendrons, azaleas and sikkim primulas in woodland and water gardens which lead to the shore. Two miles south is Ardfern, which can be reached on the main road or the shorter track over the hill. Some people get great pleasure from driving these rough narrow private roads, there are several on the estate, others prefer to conserve their car and stick to the tar. 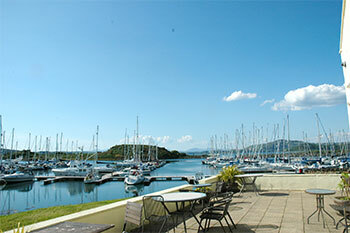 In the village which looks south down loch Craignish, straggling along the island sheltered shore for a couple of miles, is Ardfern Yacht Centre, moorings and marina for 120 yachts and fishing boats. They have a chandlery, yacht charter and slipway services. There is a village shop, a kirk, a school and a pub and hotel ‘ The Galley of Lorne’. The road runs to within a mile of Craignish point, coming to a dead end at a park with a good view of the Gulf of Corryvreckan, the third largest whirlpool in the northern hemisphere. On the way it passes Kilmaharie, a small ruined mediaeval chapel where crusader knights and the carved stones of the descendants of the Lords of the Isles survey the snow capped peak of Ben Cruachan reflected in the tranquil waters of Loch Craignish. Further on Craignish Castle can be seen across the bay. It was last besieged by Col Citto during the little wars of Lorne, but the green lady still walks from the old keep to watch the death of her lover, a young officer from Montrose army, tied to prison rock, to await the incoming tide so they say. The Crafty kitchen: a lovely place for lunch tea or dinner. Located in the centre of Ardfern opposite the pub, the Crafty Kitchen also has a lovely craft shop, selling Scottish and ethnic crafts, books and cards. 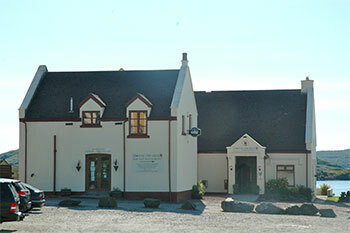 Caf specialising in local Scottish produce and vegetarian meals. Monthly exhibitions of the work of Scottish artists and craftspeople. Turnalt farm has a useful site showing wonderful photos of the local area and images of farming life in Argyll, plus you can see and order wonderful hand made and painted McNicol shepherds crooks.